The air has been surprisingly clear for most of this winter over Central Nepal, and the Himalayan peaks were out in their full glory. 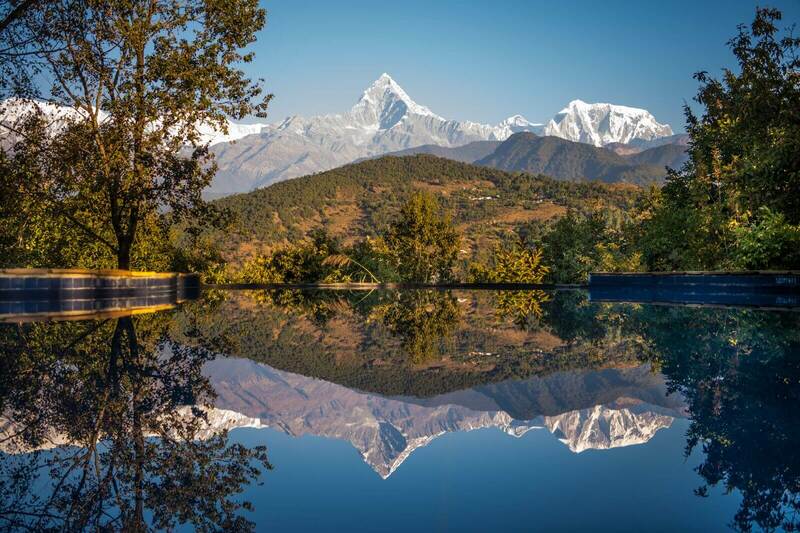 A holiday plan to see the Super Blue Blood Moon on 31 January from Tiger Mountain Pokhara Lodge, therefore, promised to be a once-in-a-lifetime event. 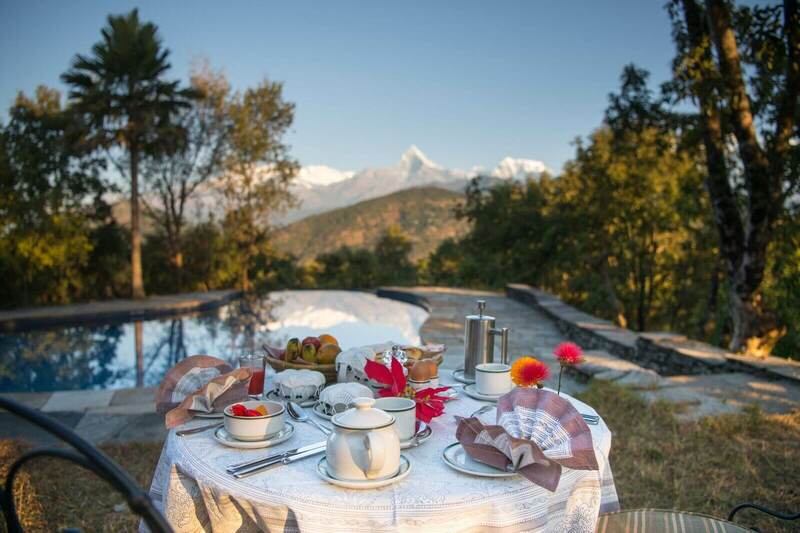 Nestled at 1,200m on a ridge, Tiger Mountain commands an unparalleled vista from Gurja Himal in the west, along a jagged horizon of the Annapurnas, Machapuchre’s skyscraping pyramid, Lamjung Himal, right up to Manaslu and Himalchuli to the east. People don’t come to Tiger Mountain to see tigers, although an occasional leopard does stroll by at night. They come here for the mountains after seeing tigers in Bardia or Chitwan. Last week, the wind direction suddenly shifted and the whole of Nepal was enveloped in thick brown haze. After a 7 hour wait at Kathmandu’s domestic airport, the view from cruising altitude was spectacular. 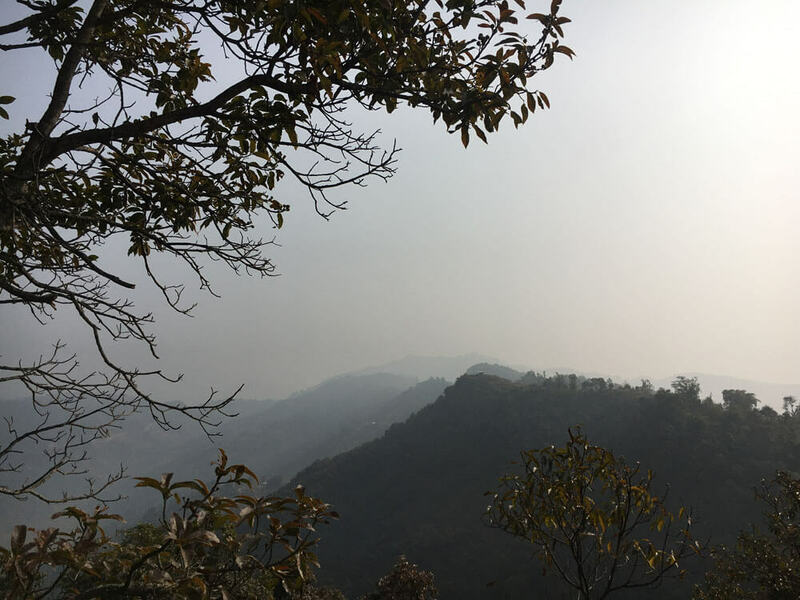 You could see that the pollution leveled off at 3,000m and the Indo-Gangetic plains were shrouded in a dirty blanket of smog that was being blown up the valleys to the mountains. Going to Tiger Mountain when the peaks are not visible, and when the smog had blocked out a rare total lunar eclipse was an important life lesson: many things don’t work out as planned, there is no point getting worked up about something beyond your control, make the best of what you have, and value the smaller things in life that you take for granted. The Zen masters taught this long ago, but it has lapsed in an age of instant gratification and the pursuit of value for money. The next morning, a hesitant sun rose from behind the forested ridge that faded into lighter shades of grey in the distance. Of all the plant species on the planet, 3% are found in Nepal, many of them in and around Pokhara with its great altitude variation and heavy annual rainfall. The trees and thick undergrowth of the community forests around Tiger Mountain are a favourite for birds, with 332 of Nepal’s 867 species here. Two new sightings were recorded last year: White-fronted Goose and Short-eared Owl. There are 279 species of butterflies and a wide variety of dragon- and damselflies. 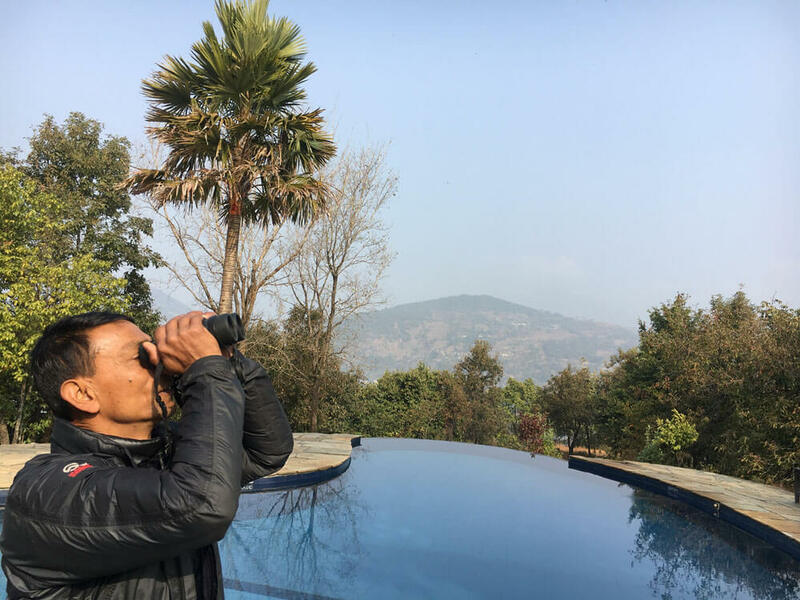 Within 45 minutes of setting off, bird guide Hari Bhandari had spotted 20 species: Greater Barbet, Blue-throated Barbet, Blue-naped Pita, Himalayan Griffon, White-throated Fantail, Rufus Gorgeted Flycatcher, Crimson Sunbird, and many more. 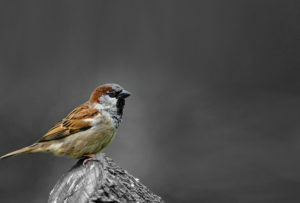 Coming across a gregarious flock of Grey Tree Pies, Bhandari whispers it is probably because there is an owl nearby, and sure enough he makes out with binoculars an Asian Barn Owl perched on a branch. The ridge where Tiger Mountain is situated was first located by trekking pioneer Jimmy Roberts while trying to find prominent hilltops to erect radio masts for the 1960 elections. 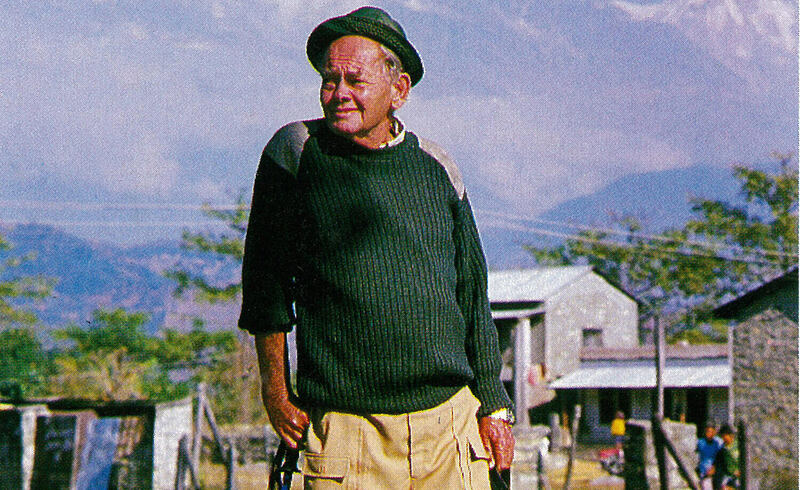 It then became a camping spot for Prince Charles’ trek to Nepal in 1979, and the ‘Royal Trek’ that it popularised as an alternative to the classical trek: more relaxed day hikes in a relatively accessible location, with good views rich in flora and fauna. This year marks Tiger Mountain’s 20th anniversary, and the resort which has got a Gold award from Travelife for sustainability, offers a model for the kind of tourism Nepal should be promoting: homegrown high-value eco-tourism that uses local products and showcases the best of Nepal’s scenery, nature and culture. A long scar is just visible through the haze to the south: the runway of Pokhara’s new regional airport will be completed in 2021, allowing direct international flights into Pokhara. Most will come for the Annapurnas, but Pokhara has a lot more to offer than mountains. 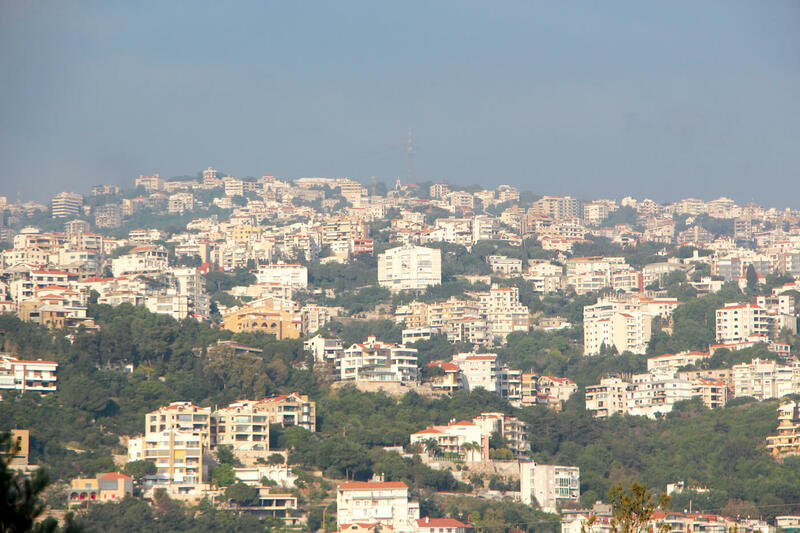 Tour operators and hotel investors may also need to have a Plan B for days and seasons when the mountains are not visible.